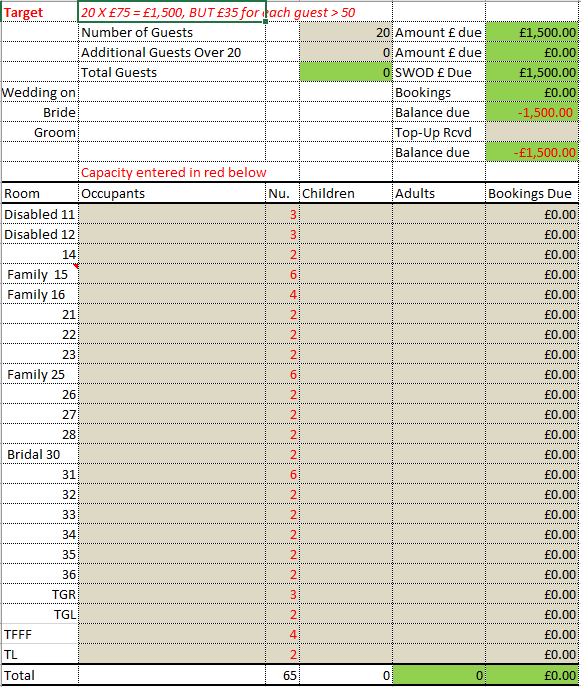 We use the Special Room Use Monitor (SRUM) Spreadsheet to help you book your Wedding Guests into the Castle's Accommodation. Select PDF link or the Document Link to open up a downloadable version of the SRUM that you can complete and send back to us. When you book your wedding under one of our Wedding Packages, you will have committed to a minimum room use / B&B occupancy level. (a) Monitoring Occupancy level against Minimum B&B level agreed under your Wedding Package. The Occupancy level needs to be monitored by you and by us, to ensure you meet the accommodation quota agreed under your specific Wedding Package. Under the Special Wedding Package, you guarantee 50 guests will stay in the en-suites at £75 each, B&B, paying £3,750 in all. Under the Mid-Week Wedding Package you guarantee 25 will stay at £75/head B&B, paying £1,875 between them. Under the Last Minute Wedding Package you guarantee 20 will stay overnight under the LMWP 50 Package, totalling £1,500, or 40 overnight under the LMWP 80 Package, total of £3,000. Under the Full Weekend Package you effectively need 45 guests staying two nights to cover the £4,900 cost of your reservation of all our accommodation for the two nights. Should accommodation use by guests fall below the agreed amount, on the day of your wedding, you will make a top-up payment for the balance. 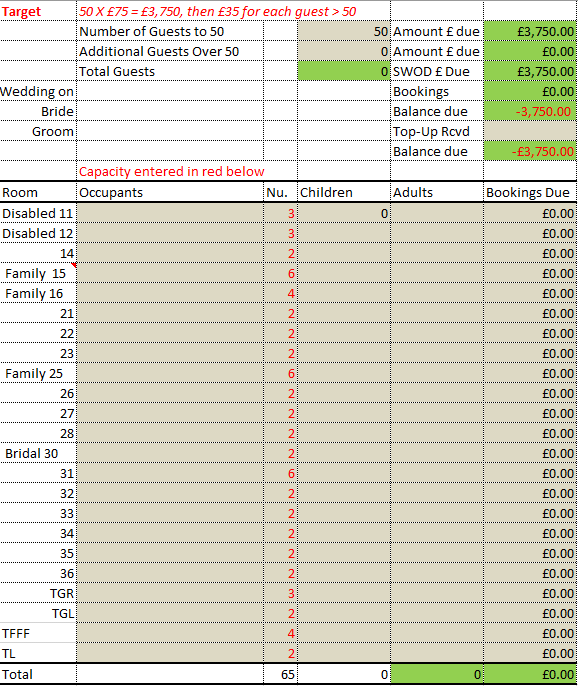 We can calculate any shortfall 48 hours before your wedding date, because all B&B bookings are secured at that point. Guests who book their own rooms become liable for the cost of their booked rooms and cannot cancel within less than 48 hours of the date of stay. To calculate the top-up payment due from you (if any) we use an Excel form called SRUM - Special Room Use Monitor. This automatically calculates the income due from guests, subtracts it from the Accommodation Usage requirement on your specific Wedding Package and gives you the correct figure for any top-up that is due for un-booked rooms. (b) Accommodation 'Reserving' and Accommodation 'Booking'. Use the SRUM form to pre-allocate/ 'reserve' some or all rooms to your guests. To view the rooms - see the Accommodation Table. Click on each link thereon to view and select rooms best suited to your guests. You can 'reserve' specific named guests only in the family rooms. Or you can reserve the disabled rooms for your elderly guests or wheelchair users. Or you can go the whole hog and 'reserve' all the bedrooms for your entire wedding party. Reserving ALL the double rooms is not strictly necessary, as most guests choose their own double rooms on a first come first served basis. However, to distribute your guests fairly among the rooms, it is advisable for you to reserve at least the larger family rooms for named guests. Identify who among your Wedding Party are families willing to share a triple or family room together. Ground floor rooms may be best 'reserved' for elderly guests who need them most. 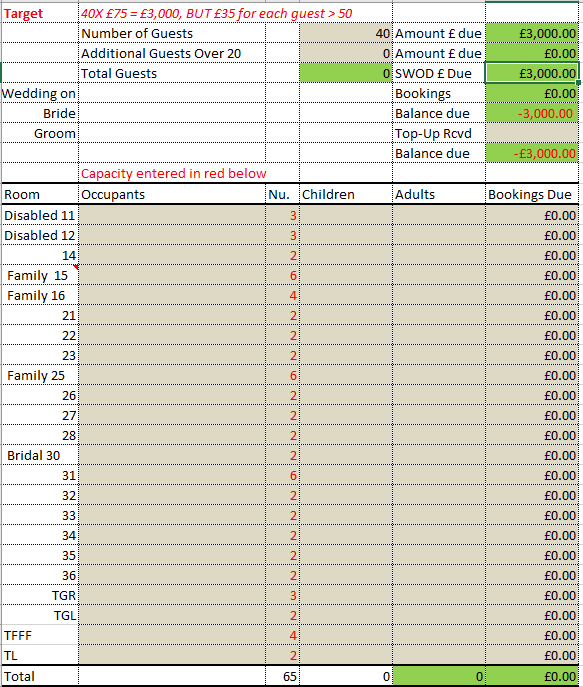 The SRUM shows you how many guests can be booked into each room, with a column for the first two occupants to pay £75 each, and a separate column showing how many extras the room can accommodate at £35 PPPN (per person per night). An exception applies to AB15 and TFFF, which can take up to 4 guests at £75 per person B&B. Overflow accommodation is available in the Nurses Building budget non en-suite Rooms. These are £35 PPPN based on two sharing. They are very basic. Accommodation in the Nurses Block does not count towards your required guest accommodation numbers for your wedding. Use the SRUM to reserve the rooms for your guests and then send it to us. Note we have provided different SRUMs for each Wedding Package as the required guest accommodation numbers varies with each Package. When you send out your Wedding Invites, advise the reserved guests which rooms they're in. Then when they call us to book their room with their own card details, we will know which room you want us to book them into and they should know which room to ask for. For our part, when we receive your room reservations for your named guests, we will enter your guest names into the Room Bookings spreadsheet our end. Then when the Guest calls to confirm their booking, we will mark the room as booked out to them. Until the Guest books and confirms their room, the liability to pay for that room remains yours. Therefore if you do not require rooms and have reserved more rooms than you are required to fill under your wedding package, you will need to cancel any rooms not required that remain in your name, at least 48 hours before the wedding date and preferably much sooner so we can fill them with other B&B guests if you are not requiring them. Conversely, WE will only block out rooms for your wedding guests up to the minimum requirement under your Wedding Package. In the case of the Special Wedding Package, this will be 'all the rooms' since you will need them all under that Package. But in the case of the Last Minute 40 Package, we will ONLY reserve 10 rooms for the minimum requirement of 20 overnight guests under that Package, and under the Mid Week Wedding Package we will ONLY reserve rooms up to your minimum contractual requirement of 25 Guests. Therefore if you feel you need more rooms than the minimum under your package, you must reserve them in the name of the guests you wish to allocate the rooms to. Block Reserving Rooms in your name (without 'reserving' them for named Guests) is NOT advised. This is because when a guest calls to book, our system will show the rooms booked in 'your name only' as being unavailable for other guests. So you need to differentiate between rooms you are booking for 'yourselves' and rooms you are booking for guests (which you must 'reserve' in the specific guest's name). Otherwise we may refuse bookings from your guests, as our system will show rooms are booked out to 'you'. We can send you copies of your own SRUM and enter bookings on it to update it for you, as and when you wish to see it. You will want to monitor your own Guest Room bookings as it (A) confirms who is definitely booking in for your wedding and (B) confirms how you are doing on filling the rooms, up to your minimum room usage requirement. As bookings come in they are entered on our booking system. When you need to know who has booked into each room, you can ask us for an 'updated SRUM'. We have a procedure where we enter the postcode of the occupant once they have 'confirmed their booking'. If there is no postcode, it indicates to us and you that the room is 'reserved' but not yet 'booked' by the guest. Reserved rooms remain yours to pay for, until they are booked out to an actual wedding guest whose post code and card details we have on file. This self-calculates the amount owing by the Bride and Groom. As Bookings are confirmed and a post code is entered, the amount owed by the Bride and Groom reduces as rooms are booked out to Guests. 2. Alternatively your Planner may decide to just not enter the amounts in the 'bookings due' column for the Reserveds, and only enter the amounts in the 'bookings due' column once the room is booked out to a Guest. Ideally both Option (1) and (2) should be adopted to keep things really clear. If you are in any doubt about what we are sending you, please email us to ask. To download instructions on how to use our Special Room Use Monitor (SRUM) Spreadsheet please click here to download our PDF instructions. Download the relevant spreadsheet or PDF for your Wedding Package. Save it to your device before trying to alter it. Once you start entering your 'room reserves', save the SRUM with a different name, so the original 'master' always remains intact. If you have any problems downloading a spreadsheet or PDF please email us though this link.